From Board Chair Maria Horn It is my privilege to serve as Chair of the Board of Directors of Women’s Support Services (WSS) whose work to end domestic violence and abuse is profound and significant. WSS continues to serve its clients and community with excellence, dedication and heart, touching the lives of over 550 adults and children who found themselves in danger and in need, as well as educating over 6,700 participants in our prevention and community education programs. This past year was one of change for the agency. In January, we welcomed our new Executive Director, Dr. D. Elizabeth (“Betsey”) Mauro. Having been both a scientist and a pastoral leader in her previous work, Betsey brings with her both rigorous clarity and profound emotional engagement with the mission of WSS. A native of the region, her deep connection to our community informs the fresh perspective she brings to the agency and its work. As part of the search process that led us to Betsey, the Board had extensive conversations with staff, community leaders, and volunteers. These conversations not only provided us with valuable input in selecting our new Executive Director, but also inspired us. We heard stories of survivors of domestic violence and were moved by their courage and resiliency. We confirmed that WSS is staffed by skilled and dedicated individuals who serve clients with dignity and compassion. We celebrated that we are supported by numerous volunteers and community leaders who passionately believe in our mission. We were encouraged by our community partners who emphasized the continued need for our services and appreciation for our collaborative efforts. 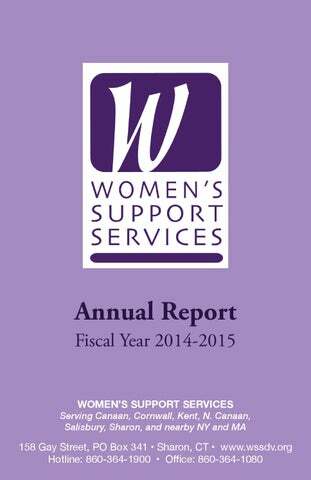 WSS is one of two remaining local agencies that provide services free of charge. This is possible by the financial support of many generous donors and the strength of support for our annual garden tour and sale, Trade Secrets. This outpouring of generosity ensures we can continue to provide high quality services to those in need. On behalf of the Board of Directors, it is our great privilege to support the work of WSS and ensure that WSS will continue to be there for those who need us for many years to come. We hope you will join us in this important work. Donate, volunteer, invite us to speak about our work at your community gatherings…all are acts of encouragement with tangible results. For more information or just to say hello, contact any board member or Betsey. Your interest helps move us forward as we work to create communities free of domestic violence and abuse. Women’s Support Services provides comprehensive support and advocacy services to domestic violence victims/survivors and their children, focusing on immediate and long-term safety, empowerment, dignity, and hope. We respond to crises 24 hours a day, 7 days of the week, 365 days of the year through our hotline. We work with walk-ins during business hours at our community-based center. Our free, confidential, client-centered services include individual and group counseling, advocacy, safety planning, education, and support in accessing resources. Women’s Support Services is here to assist victims in navigating systems, whether through coordinating services with other providers, or by accompanying clients to court hearings, medical exams, police interviews, and other appointments. When a family violence arrest occurs in our region, our courtbased Family Violence Victim Advocate provides immediate and ongoing support to victims from arraignment through the ongoing court process. Community Education & Prevention Education In our efforts to end violence in the home and in relationships, we believe that we must work to change the way society thinks about and responds to domestic violence. Our community education programs aim to increase public awareness and understanding of domestic violence and abuse through community engagement, outreach, and educational workshops. Last year, our community educator and staff were active in the community, reaching 1443 adult participants through 371 presentations and public awareness activities and events. Primary prevention reduces domestic violence by changing attitudes, behaviors and norms that support the perpetration of violence. We believe that teaching children peaceful, effective alternatives to violence is critical if we hope to decrease school, family, and interpersonal violence in our community. WSS provides violence prevention education free of charge to the Region One school district, local private schools, local daycares, and the neighboring schools in New York, with curricula that are age-appropriate for children from pre-K through 12th grade. Topics covered include teen dating violence, healthy relationships, bullying and cyberbullying, self-esteem, conflict resolution, gender diversity, and respect. Last year, our community educator and staff were active in local daycares, public, and private schools, providing 401 primary prevention workshops to 5872 children and youth. Domestic Violence: Is it Common? In the Words of Our Clients When I made my first call to Women’s Support Services, I was shaking, hyperventilating, apologizing, looking over my shoulder, pacing and completely doubting myself for making that phone call. But a voice on the other end of the phone gently guided me through that call. That voice made me feel, believe, and know that, in that moment, I was safe. Shortly thereafter, I met that voice in person. When I first met with Liz, we talked for over an hour and even as I was harshly judging myself, not once did I feel judged by her. In fact, I felt validated and for the first time in a very long time, I didn’t feel alone. At the end of that first meeting, Liz told me to go down to the WSS boutique and get some clothes for myself and my children. I told her that wasn’t necessary, that I wasn’t poor, I wasn’t in need... but she insisted. I am so thankful that she did because I wore that outfit for a week. I had left my home with only the clothes on my back, my children, and their coats. I was my last priority. Mountainside substance abuse treatment center in Canaan, CT. Women’s Support Services partners with the CT State Police in implementing the Lethality Assessment Program (LAP) in the Northwest Corner. This program enables police on the scene of a domestic violence call to assess a victim’s risk, and to link victims at greatest risk to their local domestic violence agency for support and safety planning. This innovative program is a result of collaboration between Connecticut Coalition Against Domestic Violence (CCADV) and the Connecticut Police Officer Standards and Training Council (POSTCT). One Donor’s Story Adelaide Harris moved to Salisbury, Ct., in 1983 after she married her husband, Bill. Now that their children are grown and out on their own, Adelaide spends time with her family, traveling, sports and meeting new people. She is also very busy making jewelry for her Adelaide Harris Jewelry line and is currently serving as a board member at the Salisbury School. Adelaide and her family have been supporters of Women’s Support Services for the past 27 years. Q: How did you get involved with WSS? A: My involvement started in 1987 as a donor. Then I was asked to be an underwriter for the very first Trade Secrets in 2001, which was so different and unique for a local fundraising event. That is when I learned more about WSS and what they do. I knew this was a valuable and necessary program to the community. I was asked to serve on their board in 2004 and also served as one of the Trade Secrets underwriting committee chairs. I’ve been involved ever since, as a supporter and ambassador to WSS. Q: How do you feel WSS impacts the community? A: The cause is domestic violence and not an easy topic to discuss. However, through the education that they provide in the schools and community about domestic violence, WSS has made us more aware of the issues, and conversations now take place within families and in the community. In this area, there are not many agencies that provide free services to the community regardless of their socioeconomic background. WSS provides a 24/7 crisis hotline, emergency short-term shelter for victims, advocacy in the criminal court so victims can be heard in a court case, and so many other programs and services. Q: Why do you stay involved? A: The staff and leadership of WSS are dedicated to their work and to the cause. They continue to monitor the needs of the community and trends of domestic violence. Over the years, I’ve seen the growth of WSS through the programs and services that are offered and the collaborations created with other agencies. Some of their programs and services are not funded by state or federal grants, so that is why it is so important for the community to donate to this cause. I enjoy working with WSS, helping with their fundraising efforts. I talk about the work that WSS does to my friends and people that I meet, and encourage them to support the cause, so that WSS can continue the fight against domestic violence. The mission of Women’s Support Services is to create a community free of domestic violence and abuse through intervention, prevention and education. We offer free, confidential, client-centered services focused on safety, support advocacy and community outreach. All WSS services are confidential and free of charge.